One of the largest employee wellness events at Emory is set to take place this fall. 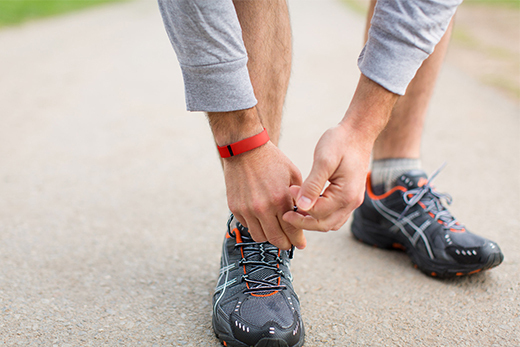 Employees of Emory University and Emory Healthcare are invited to participate in the Move More Challenge, an eight-week physical activity program utilizing FitBit trackers to encourage everyone to "move more." Registration for the Move More Challenge opens Aug. 17 and closes Sept. 14. The challenge takes place Sept. 21 through Nov. 15. This new program is part of Healthy Emory's strategic initiative to support employees to increase their daily activity, eat healthier and more effectively manage stressors. "We are very excited to launch this program communitywide," says Michael Staufacker, director of health management. "The Move More initiative was very successful last year when we piloted it to a select group of sites. Employees loved the challenge and asked that we bring it to all Emory employees. We are building on that enthusiasm by offering it to the entire Emory community." Fitbit is a wearable mini-computer that gathers data about a person's activity, such as number of steps, distance traveled and calories burned. Last year, more than 1,200 Emory employees participated in a two-month pilot program; collectively, they walked 204,000 miles, or about eight times around the globe. To participate in this year's expanded program, employees will register online, order a Fitbit device, then join the challenge and select their team (department). Emory is partially subsidizing the cost of the Fitbit device for employees. To encourage family members to be more active as well, Emory is also providing special "family and friends" pricing for additional devices. "The reason we are offering this challenge is simply to encourage more daily movement," Staufacker explains. "Guidelines from the U.S. Department of Health and Human Services suggest that adults get at least 150 minutes a week of moderate physical activity. "About 60 percent of our employees do not get enough physical activity in their day; this challenge is an effort to help us all 'move more,'" he says, citing data from Emory's 2014 health risk assessment. Kasi Crawford, a research administrator at the Emory Institute for Drug Development, participated in the challenge last fall and credits it to helping her achieve her weight loss goals. "My biggest accomplishment was sticking to the goal that I set for myself and losing 40 pounds," she says. "Being able to receive the Fitbit and holding myself more accountable has made a big difference in my life." Fitbit's online platform and mobile app allow participants to easily track their individual progress as well as their overall team's progress. Throughout the challenge, Emory departments will be able to see how they compare with other departments in terms of total steps. "It creates a little friendly competition too," adds Staufacker. Crawford says that being connected to others is what helped her be more accountable. "Because this challenge and the Fitbit device connect you with other folks within Emory as well as your friends outside, it allows others to hold you accountable," she says. "I love it." A variety of events and webinars will supplement the Move More Challenge, notes Melissa Morgan, wellness manager with the Faculty Staff Assistance Program (FSAP). "Several of Emory's wellness champions have events planned to build excitement in their departments and FSAP will be presenting a series of webinars throughout the challenge to help keep people motivated," she says. For more information, including answers to frequently asked questions, visit www.emory.edu/MoveMore.